Farm policy. Two simple words that encompass a variety of definitions. For the consumer, farm policy helps ensure a safe and affordable supply of food and fiber. For the American farmer, farm policy is the safety net that helps them in their annual dance with Mother Nature or many other factors outside of their control. However, no matter what farm policy means to you, one thing holds true: strong farm policy is imperative to the future of agriculture. Currently, all eyes are on the 2018 Farm Bill. Will Congress be able to pass a Farm Bill before the current legislation expires? Will farmers maintain the strong, reliable safety net they need? Along with these questions, it is crucial to consider the importance of this single piece of legislation to the nation’s farmers. In short, what does farm policy mean to multi-generation farm families? The answer – security. 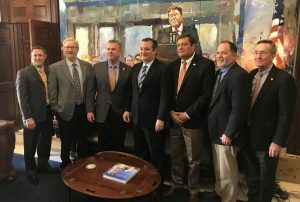 From left to right: Kody Bessent, Johnie Reed, Stacy Smith, Senator Ted Cruz, Brent Nelson, Rex Kennedy, Steve Verett. Photo courtesy of Plains Cotton Growers. on Growers, Inc., said there is now hope with cotton being returned to coverage under Title 1 of the Farm Bill. Verett said farmers also have crop insurance to help protect against unpredictable weather. Farm policy was started in the 1930s and was widely driven by suppressed economic times. Kody Bessent, Vice President of Operations and Legislative Affairs at PCG, said farm policy also has evolved over the years to adapt to where we are today. He said along with crop insurance, farm policy has slowly evolved to look more at price or revenue driven mechanisms as a safety net. Despite its name, the Farm Bill serves more than just American farmers. It supports consumers as well. Without sound farm policy, consumers would not have the safe and affordable supply of food and fiber they are afforded today. Individual farmers are not alone in their efforts to advocate for strong, effective farm policy. There are many local, regional, state and national organizations leading the way. At each of these organizations are people who are passionate about the future of agriculture. Verett said at PCG, they have a vested interest in their work because of their personal, direct ties to farming. Bessent said his farming background gives him a greater understanding of what producers are going through. “Having a good base of my farming background as well as the implications of our actions allows me to speak in greater influence whether we are in D.C.
Verett said no one is more qualified to tell agriculture’s story than the farmers who live it daily. If you don’t tell your story, someone else will, and they may tell it wrong. Getting involved does not have to be an instant thing. Bessent said to start out small by getting involved in your local community and learn more as you go. Simply put – Tell your story. Buerkle said a farmer telling his or her own story can be more effective than a similar message coming from an organization or business. Buerkle also said that sharing your story can be a family affair. Each member of a family can have a valuable perspective.